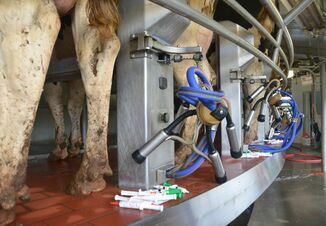 Dairy producers and veterinarians now have another tool in the prevention and reduction in antibiotic use with the debut of the first vaccine licensed for dairy cattle to prevent mastitis caused by Klebsiella pneumoniae. AgriLabs announced on July 23 that KLEBVax SRP was now available on the market. A similar autogenous product was offered by AgriLabs in partnership with Epitopix that used a bacterial extract of Klebsiella SRP. A field study by Iowa State University using KLEBVax SRP showed a 71% reduction in infection within 90 days of calving versus a placebo group. The new vaccine works by activating the animal’s immune system to produce antibodies that bind and block the transfer of iron through bacterial cell wall porins. Gram-negative bacteria such as Klebsiella require iron for growth and survival, so the vaccine helps deprive the bacteria of nutrients.